Slow cooking is one of my favorite ways to get dinner on the table. It frees me up to focus on other things and the meals are always delicious. 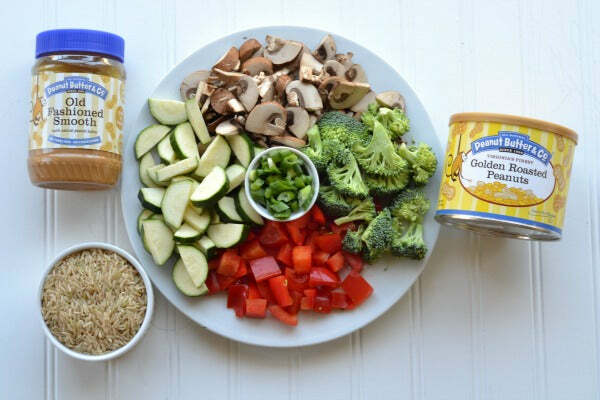 Though there’s peanut butter in the sauce, the flavor becomes very subtle due to the other ingredients. Instead of contributing a strong peanut butter flavor, it imparts a creamy, rich texture to the sauce. I used Old Fashioned Smooth peanut butter but Smooth Operator or The Heat is On would work beautifully. 1. Put the sliced bell pepper in the bottom of a large slow cooker. 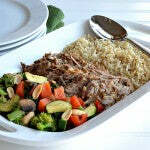 The slow cooker should be large enough to accommodate the pork without it touching the sides. (If it touches a little in one or two places that’s ok.) Place the pork on top of the sliced bell pepper. 2. 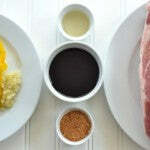 Whisk together the soy sauce or coconut aminos, garlic, coconut palm sugar, and rice vinegar. 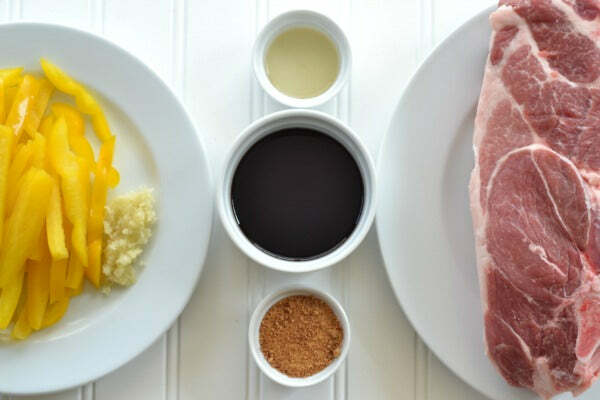 Pour the mixture on top of the pork. Cover and cook on low for 5 to 7 hours, until the meat is fork-tender. 3. 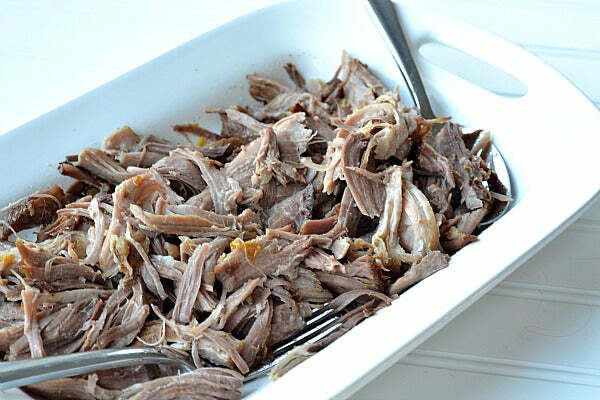 Once the meat is cooked, remove the pork from the slow cooker and shred it. 4. Strain the remaining juice into a medium sauce pan. Discard any solids. You can also use a gravy separator to remove much of the fat in the sauce at this point. 5. Heat the sauce and whisk in the peanut butter. 6. Stir together the cornstarch and water. 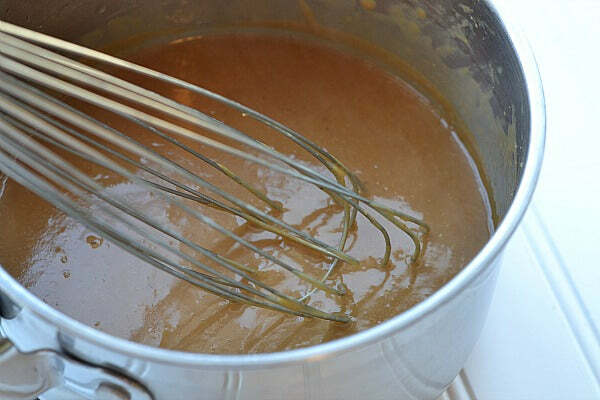 Whisk the mixture into the peanut butter sauce. 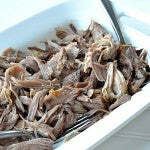 Return the meat to the slow cooker and mix in a generous amount of sauce. You may not use all of the sauce; that’s ok. Keep it for serving. 7. 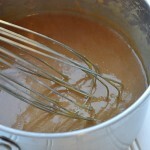 If the sauce thickens as it sits, just whisk in a little water until it reaches the desired consistency. Put the rice and water or stock in a medium sauce pan. Cover, bring to a boil, then reduce to a simmer. Cook for 45 minutes, or until the rice is tender. Let rice stand for 5 minutes covered then uncover and fluff with a fork. Keep warm until served. 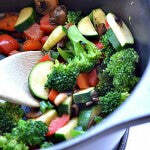 Heat the sesame oil in a large saute pan or wok over medium-high heat. 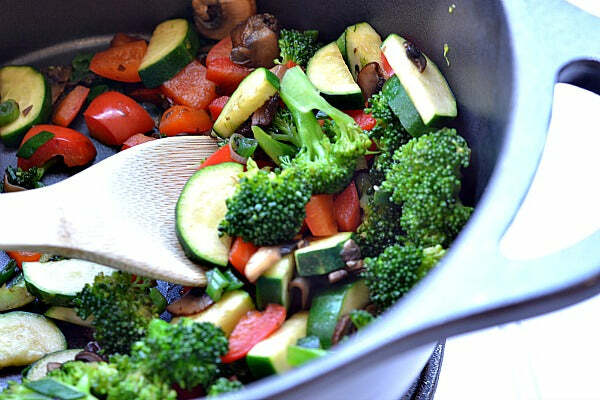 Add the broccoli and mushrooms and cook, stirring constantly, until the broccoli is bright green, about 2 minutes. Add the bell pepper and cook for another two minutes, just until it begins to get soft. Add the zucchini and cook for another two or three minutes, until the zucchini becomes tender but still solid. Stir in the green onions. Remove from heat and keep warm. 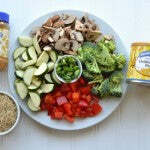 Sprinkle the Golden Roasted Peanuts over the vegetables just before serving. Put the rice in a bowl or on a plate. 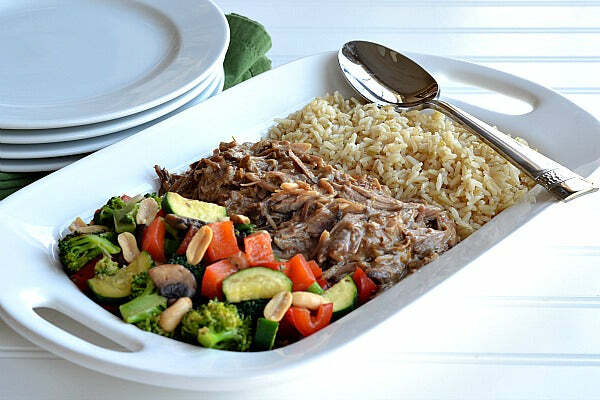 Top with stir-fry vegetables, then top the vegetables with the slow cooker pork. If you have extra sauce, serve it warm on the side. 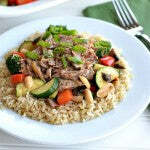 What other slow cooker meals would you add peanut butter to? Leave a comment below with your answer to enter for a chance at winning a jar of Old Fashioned Smooth, the peanut butter used in this recipe. – The giveaway is open to USA residents only and will run until Monday, November 18, 2013 at 11:59 PM EST. – Winner(s) will have until 11/21/13 to claim their prize or we will choose another winner. – Winner will win one jar of Old Fashioned Smooth peanut butter. Product will be shipped by Peanut Butter & Co. 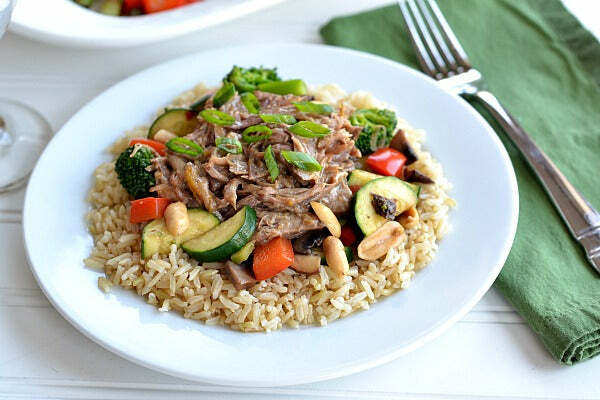 The post Slow Cooker Asian-Inspired Peanut Butter Pork with Brown Rice and Stir-Fry Vegetables appeared first on - Peanut Butter & Co. Recipe Blog.